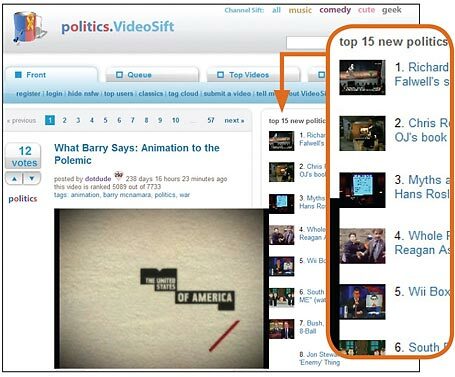 VideoSift gives videos a community flavor--you can vote and comment on videos, and mark and share favorites. Though YouTube is the best-known video sharing site, plenty more sites feature free clips of crazy lip syncing, Mentos fountains, and even the odd useful how-to video. People are uploading hundreds of thousands of clips every day--how do you sort through them all? Luckily, other sites will find the best and coolest clips for you. A couple of these sites even let you bookmark and categorize your favorites. Winner: VideoSift is a video site based on community submissions and voting. The site currently caters mostly to the taste of the geek-and-college crowd, but that should change with time. Here you can mark favorites, comment, vote on clips, and share videos. You can't become a fully privileged user until you submit a video that receives at least five up-votes (probationary users don't get as many voting rights). But finding a good submission shouldn't be too hard, and this site is cool enough to warrant putting in the effort. Runner-up: VDiddy is the perfect first stop for some post-lunch entertainment. It provides no log-in, bookmarking, or commenting, simply a front page that features the top 12 videos of the moment from 11 different video sharing sites, including all the biggies. A vertical bar on the left lets you switch among the different sites. Hover your mouse over a clip thumbnail to enlarge it slightly; click on it, and it will play in an embedded player. Runner-up: Dabble, by contrast, is a social networking site that lets you organize, collect, comment on, and share video clips from around the Web. Using a toolbar link, you can bookmark clips from various sites. You can then tag them and make or view sharable playlists. Dabble can't bookmark videos embedded in a Web page, however, and if you attempt to bookmark a video on Dabble before the video ends, Dabble restarts it. Also-rans: Digg has an active video voting site, but the top clips tend to linger too long. Voting site Video Bomb accepts Flash, QuickTime, and Windows Media videos for upload--but it has no critical mass of submitters yet.